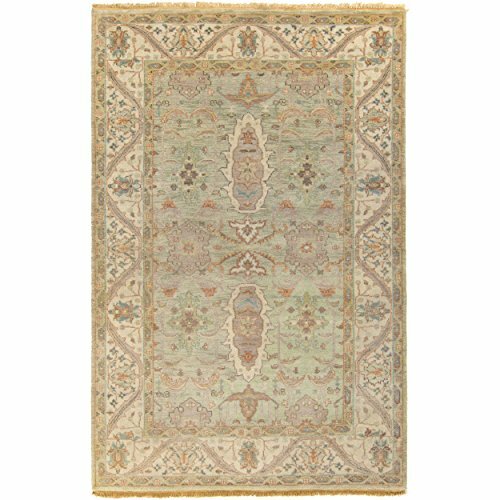 Update any setting with this traditional area rug. Hand-Knotted with 100-percent New Zealand wool, this border area rug is sure to be the finishing touch you've been searching for. Primary materials: 100-percent New Zealand wool Latex: No Pile height: 0.54 inches Style: Traditional,Transitional,Classic Primary color: Multi Secondary colors: Seafoam,beige,taupe,rust,lime,chocolate Pattern: Border,Floral,Paisley,Oriental Tip: We recommend the use of a non-skid pad to keep the rug in place on smooth surfaces. All rug sizes are approximate. Due to the difference of monitor colors, some rug colors may vary slightly. We try to represent all rug colors accurately. Please refer to the text above for a description of the colors shown in the photo.